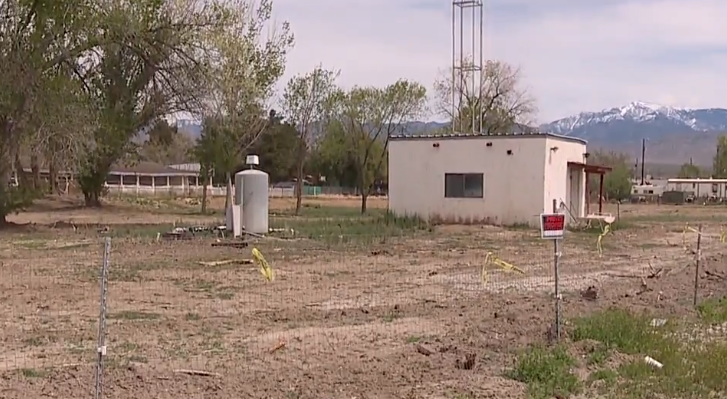 A man who was arrested in 2017 for attempting to find buried treasure in Pahrump has been at it again. The Nye County Sheriff's Office says that it has arrested 56-year-old Richard Cleaves for trying to find any buried treasure left behind by Ted Binion at his former property in Pahrump, Nevada. Cleaves is being charged with burglary, conspiracy to commit grand larceny and destruction of property. LAS VEGAS, Nevada — A man who was arrested in 2017 for attempting to find buried treasure in Pahrump has been at it again, according to Nye County Sheriff's Office. Gambling executive Ted Binion, son of the casino owner Benny Binion, died more than 20 years ago in Las Vegas under suspicious circumstances. His body was found in his home on Palomino Lane in Las Vegas and his stripper girlfriend, Sandy Murphy, and her lover, Rick Tabish, were later arrested for his murder. Although his death was reported as a suicide by his girlfriend, it was believed that Binion was actually killed for his money. It was fairly well known that Binion hid money and valuables in various locations before he died. A large sum of money that was reportedly hidden in the Palomino Lane home has never been found. Before his death, Binion hired contractor Rick Tabish to help him construct a vault in Pahrump where he hid 6 tons of silver bullion, casino chips, paper money and more than 100,000 coins worthy between $7 and $14 million. Two days after Binion's death in 1998, deputies in Nye County found Tabish and two other men digging up the vault off Highway 160. Tabish was arrested. In June 1999, Tabish and Sandy Murphy were charged with Binion's murder. Sandy Murphy and Rick Tabish were tried and convicted of his murder and then acquitted after another trial. Murphy is currently living in Southern California and Tabish is still in prison for stealing Binion's silver. Even though a fortune was discovered in the vault, it has long been believed that there is more out there. On April 2, the Nye County Sheriff's Office received a call about a possible burglary at Binion's former Pahrump home. The property manager showed the deputies several holes on the property and a demolished brick BBQ smoker. He also shared a surveillance video that showed 3 men with shovels entering and exiting the property. The property manager was able to identify one of the men -- 56-year-old Richard Cleaves of Pahrump. Cleaves had worked at the property previously but was told not to come back after he was arrested in 2017 for digging holes in an effort to find anything that might have been buried by Binion. Cleaves told detectives at the time that he read online that millions of dollars were buried at the Pahrump property. The sheriff's office is still looking for the men in the video. Anyone with information is asked to call the sheriff's office at (775) 751-7000.